WARNING: This product can expose you to chemicals including Lead, which is known to the State of California to cause cancer, and Bisphenol A (BPA) and Lead, which are known to cause birth defects or other reproductive harm. For more information go to www.P65Warnings.ca.gov. Complete keyboard package with stand, bench and pedal. This complete keyboard kit features the Casio Privia PX-160GD portable 88-key digital piano. It also includes a matching stand that attaches directly to the piano, which make the PX-160GD an attractive home console piano. A sustain pedal, keyboard bench and a set of headphones complete the assortment. The PX160GD is part of the latest version of the Privia series, housed in a champagne gold-colored chassis. It is bold and outrageous, stylish and handsome, and is every bit a Privia. Some newer technologies have been installed in the latest Privia, notably Multi-Dimensional Morphing AiR sound generation. Privia piano sounds and other keyboard sounds have never been more realistic both in terms of the precise timbre and in terms of how that timbre responds to key touch. The chief reason to get a digital piano of course is the piano sound, and the PX160GD's piano, created with Casio's AiR technology (Acoustic and intelligent Resonator), is as accurate and satisfying a piano timbre as any other on the market in its price range. Standard sustain pedal with switchable polarity, usable for any model keyboard with a 1/4" damper pedal input. Larger chassis with rubber skid on the bottom to prevent your pedal from jumping around on hard floors. Silent operation, quality cable. 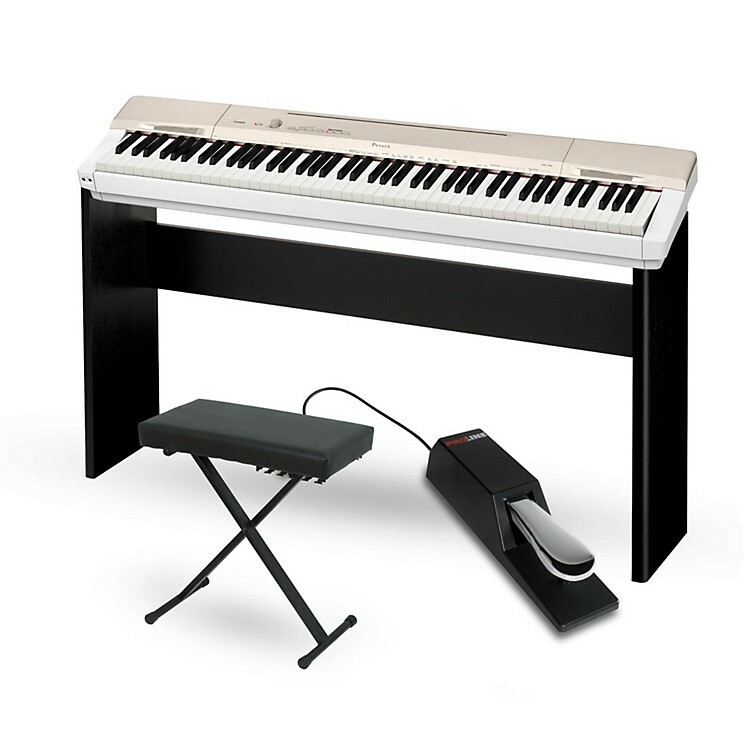 The Casio CS67 is a keyboard stand that ably supports the Privia PX-160BK digital piano. It provides a stable platform for the piano, and is complementary in color and finish. Complete package in a striking finish. Order today.